Stray Local, the amazing three-piece featured in a recent KFR show review, just released their debut EP. We got our hands on a copy in anticipation of their official CD release show this coming weekend at Ted’s in Wilmington. 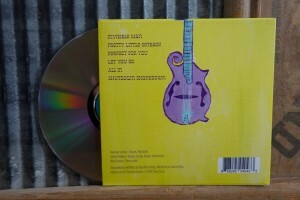 The artwork is light, featuring a blue acoustic guitar on the front and a purple mandolin on the back, both placed on a bright yellow background with very little text. These two instruments are actually beautiful paintings by vocalist Hannah Lomas, similar to paintings and handmade artwork displayed at shows. The design is simple and captures the band’s unassuming vibe. The EP itself is very much a representation of what the band sounds like live – polished, no frills, unadulterated folk music that isn’t buried under effects. 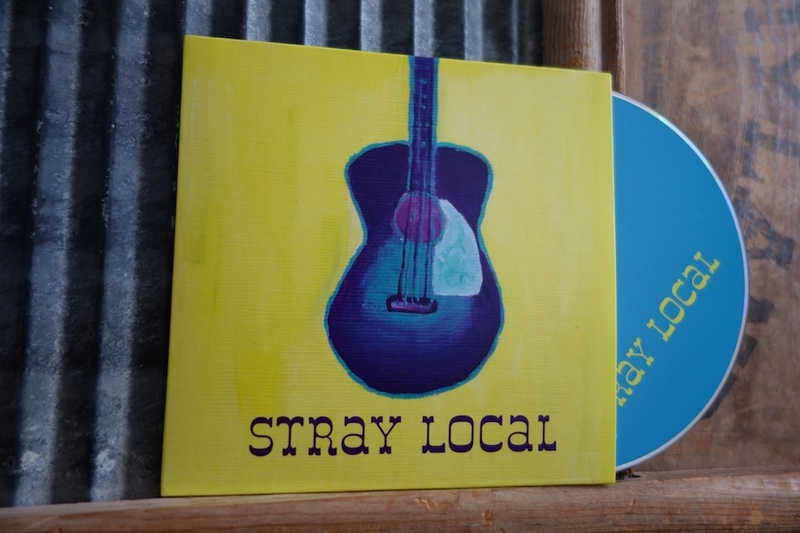 So often a band releases a recording that does not do them justice, and we were relieved that this very much wasn’t the case with Stray Local. The music comes across as a slightly cleaner version of what is already an excellent live performance, stripped of background noise but not of the organic energy of the songs themselves. It is a credit to both the band and audio engineer Jeff Reid for recognizing what the band does well and not ruining it with studio bells and whistles. The six songs included on the EP represent the band well. “Invisible Man” is the upbeat leading number, featuring guitar, mandolin, percussion, and harmonies in the traditional bluegrass style. It’s a rousing number about a rambler, “in his own town but never at home…the one you ignore as he walks past your door.” Vocalists Hannah Lomas and Jamie Rowen harmonize throughout, including an a cappella chorus, while percussionist Nick Simon keeps perfect time on the snare and tambourine. “Pretty Little Setback” describes a tempting yet toxic relationship featuring strong and sassy vocals from Lomas, killer blues guitar riffs from Rowen, and a funky beat on the cajon from Simon. It’s here that we get to hear some of the intricacies in the instrumentation that are often lost in a loud music venue. In fact, we lamented that there was not an extended jam with some hot blues guitar from Rowen and some vocal jazz riffs from Lomas, with perhaps even a cajon solo thrown in at the end. When something sounds this good, two short minutes just isn’t enough. “Perfect for You” is a lilting mid-tempo number that speaks of an unrequited crush and sounds sweet and tender, despite the fact that Lomas laments, “Why don’t you see me, I’m standing right here?” Rowen’s backing vocals are gentle and show off his higher range. He also contributes a solid harmonica solo halfway through the song. Lomas shows the ease of her vocal control here as well, while Nick Simon carries the song with a clean brushed beat on the bassy cajon. The EP continues on in the gentle vein with a wrenching ballad called “Let You Go,” another number that shines in subtlety on the recording. The balance between Lomas’ and Rowen’s voices is absolutely perfect and they both expertly convey an air of soul-crushing heartbreak. It’s the most somber of love songs, both believable and beautiful, with lines like “You gave yourself so honestly and always loved wholeheartedly…If I could let you go, my dreams would be empty.” If people still made break-up mixtapes, this song would be on it. Luckily, the tears dry fast once the band launches into “All In,” a fun foot stomping love/gambling analogy. Although the song comes across a bit less raucous on recording than it does live (as it should), it’s still an incredibly fun song that will get stuck in your head. Listen to it and try not to find yourself tapping your foot and singing the catchy chorus to yourself afterward, “Go all in, I’ll double down, I’ll wager something high, you’re the girl I’ve been waiting for, I’ll be with ’til I die.” We dare you. “Shutdown Shakedown” is a good ol’ fashioned banjo, mandolin, harmonica, and washboard instrumental that is the perfect closer for this well-rounded EP. Stray Local is a band that plays their instruments well and knows exactly who they are. Their debut is well done all across the board and we can’t wait to see what they deliver next. Stray Local is holding their CD Release Party in conjunction with the Third Birthday Celebration for beloved acoustic music haven Ted’s Fun on the River on Saturday, February 1st from 7-9pm. Check out the Facebook event here.